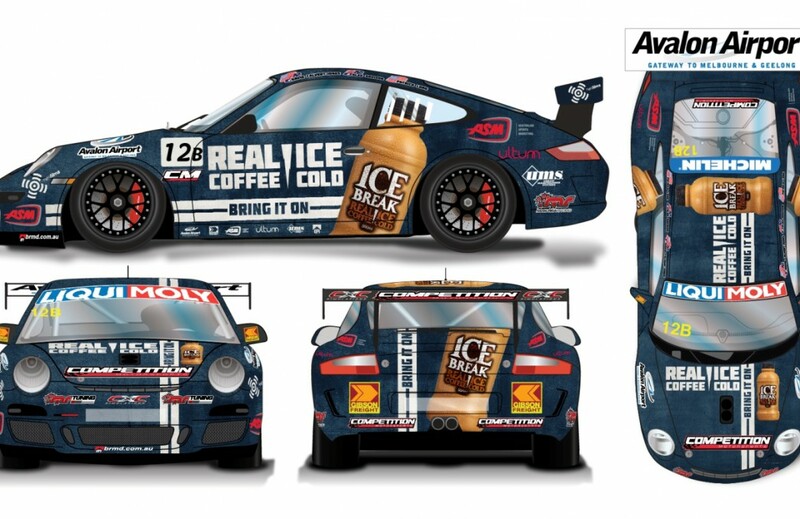 Competition Motorsports will head to the Liqui-Moly Bathurst 12 Hour with backing from iconic Australian iced coffee brand, IceBreak. IceBreak Competition Motorsports’ assault on the ‘round the clock’ endurance event at Mount Panorama will be led by US-based, expatriate Australian David Calvert-Jones, V8 Supercar ace Alex Davison and American factory Porsche driver Patrick Long. The 3.6-litre, flat-six engined IceBreak Porsche 997 GT3 Cup car will compete in Class B where it is expected to be one of the favourites for the ‘race within a race’. IceBreak prides itself on being the original brand to kick start the morning and has been associated with motors and motor sports for over a decade, notably as a sponsor of Chris Pither in the V8 Supercar Dunlop Series and V8 Utes. Competition Motorsports is an American GT sports car team established in 2006 by GT racer Bob Faieta who has won the IMSA GT3 Cup Challenge – the same series Calvert-Jones regularly competes in – three times. For the second year in succession, preparation of the IceBreak Porsche will be overseen by gun Carrera Cup squad McElrea Racing (MR), one of the leading Porsche racing and tuning experts in the southern hemisphere. The team will be looking to avenge memories of the 2013 event, when Calvert-Jones, Alex and his cousin James Davison were comfortably leading Class B until ‘CJ’ fell foul of a slower car at Forrest’s Elbow and crunched one of the Mountain’s ever-present concrete barriers. Long, a three-time American Le Mans Series champion and twice 24 Hours of Le Mans class winner, will be making his debut at the mecca of Australian motorsport having just raced at last weekend’s Rolex 24 at Daytona for the factory Porsche North America CORE team. The 2014 Liqui-Moly Bathurst 12 Hour is the 13th running of the event which will start at 6:15am on Sunday, February 9. Fifteen manufacturers including Porsche, McLaren, Ferrari, Mercedes-Benz, Lamborghini and Audi will be represented by drivers from 12 countries, with the world’s best GT and sportscar racers to be pitted against many of Australia’s leading V8 Supercar drivers. The full Liqui-Moly Bathurst 12 Hour race will be streamed live at www.bathurst12hour.com.au, while race fans can watch the final three hours of the race live around Australia on SBS ONE from 3:30pm. “I fulfilled a dream last year by racing at Mount Panorama, but this year I will be looking to fulfill my dream of finishing the race and winning our class. We have a great shot of doing so with Alex and Pat in our driver line-up and having the support of McElrea Racing during the event will be a real advantage. “From a personal perspective, I couldn’t be racing in a better team. CJ was very fast last year on his first visit to the Mountain and I got along really well with him. I am stoked to be driving with my good mate Patrick Long who I lived with and raced against in Europe over a decade ago but have never shared a car with. “Last year, the plan was actually for CJ, myself and Pat to race together but due to other commitments Pat had to pull out at the last minute, so it’s cool that we’ve been able to make it happen this year and on top of that I am working with all of the guys from McElrea Racing who I have such a great relationship with. “I can’t wait to head to Mount Panorama to drive the Icebreak Competition Motorsports Porsche. This opportunity has been long awaited ever since I started reading Auto Action when I moved to Europe. Ryan Briscoe, James Courtney and Will and Alex Davison were all friends and flat mates of mine when I was racing in karts and open wheel, and that’s where I learnt about Bathurst and set my goals towards being able to one day compete on the Mountain. “The race has massive momentum going and this year looks to be the best turn out of cars in the recent running of the race! “We are thrilled to be part of such an outstanding team in an event that will truly test the drivers and their machines. Bathurst is the mecca of Australian motorsport and the Bathurst 12 Hour event is one of the most prestigious on the Australian motorsport calendar with teams and drivers from all over the world descending on the Mountain.